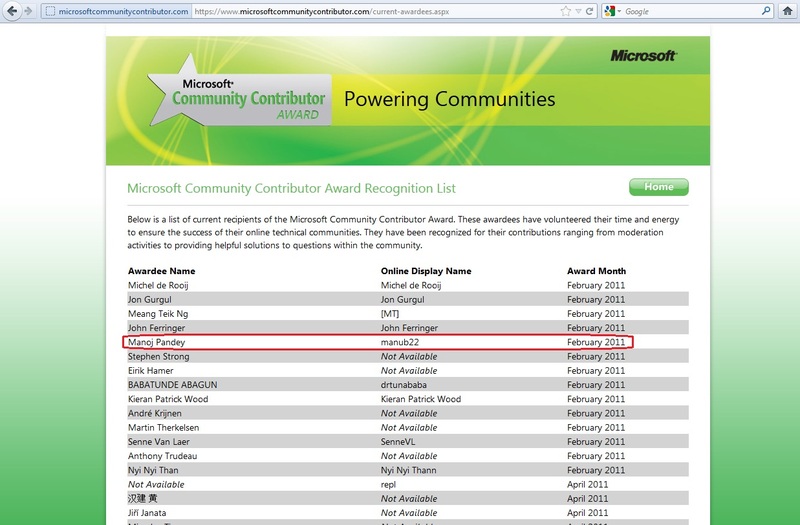 Just about a year back in Feb-2011, I was awarded by “Microsoft Community Contributor” (MCC) Award for my contributions in Microsoft’s online technical community “MSDN Transact SQL” forum. Check here for more information. This was a kind gesture from Microsoft to award people for dedicating their precious time for the community. The award includes MCC logo, badge, Safari BOL 1 year free subscription & access to some MSDN’s knowledge bank. I started following up MSDN forums at the very start of my carrier (around mid of 2006) when I was learning SQL Server. I used to put up my queries there and was very satisfied with the kind of response I used to get. I also used to browse through other questions to see what other techies are asking & are stuck upon, and sometimes try to answer those questions. This started becoming a good learning source and encouraged me to dedicate my time here. And I remember at around year 2010 Nov-Dec I was kind of addicted to this. Now whenever I get time I check the forum and answer the questions where I can add some value.